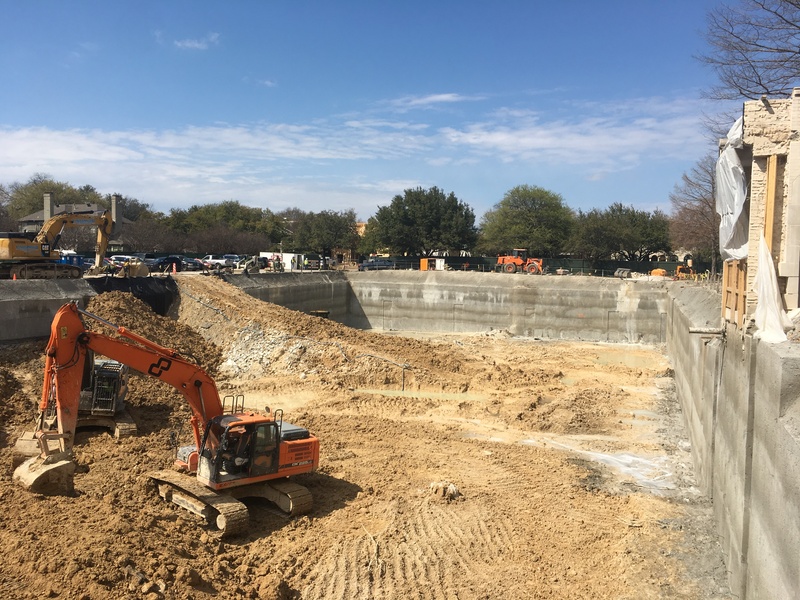 After a particularly wet winter, progress on the construction taking place at Highland Park Pres as part of the Transform project is making some noticeable steps forward. On the west side of campus, excavation below the old Hunt building is almost complete. Soon, digging will reach its ultimate depth, and a foundation for our rebuilt Hunt building will be created. This will be completed near the end of April, and then a crane for phase two of construction will be erected. 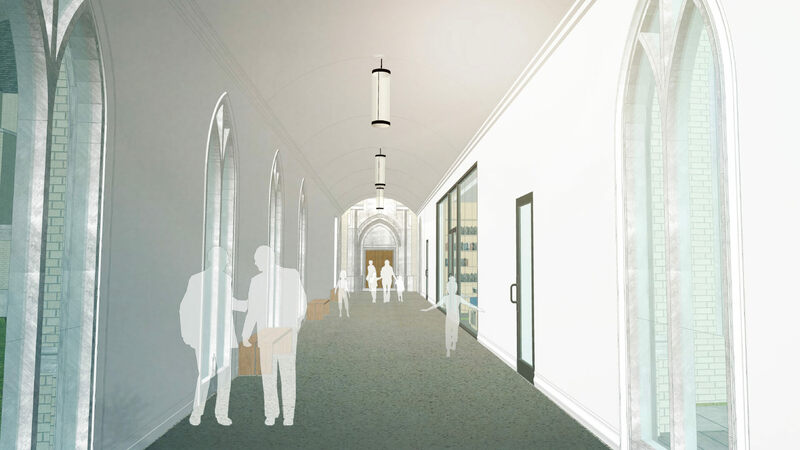 In our February update, we shared about the start of construction on the connector between the Alexander Building and the Sanctuary. Work is progressing, and a foundation for the connector will be created by the end of April, with construction completing in August. At the end of May, the remainder of the Alexander building will be closed for renovations that will last until the end of Summer. This will create some amazing new spaces for our Kids & Student ministries to teach our families about Jesus. During this time, our campus will be operating at less than 25% of its regular capacity. The only entrances to the church during this time will be into the Sanctuary from University Blvd., or near Wynne Chapel on McFarlin Blvd. Worship services and children’s classes will continue on Sundays like normal, but adult classes will take a break until the fall. Thank you for your flexibility and willingness to help guests during this time. Giving to the Transform project is going well, with gifts coming in from a significant portion of people who pledged. Please remember that ministry does not stop during construction, and that we need your continuing support of the general operating budget as well as Transform. Thank you for your ongoing support of both, so that our campus can support our ministry for the next 100 years. Construction is entering a new phase as part of our ongoing Transform project. One of the most exciting changes coming to our campus is a new connector between our Sanctuary and Kid’s areas, which will create a stronger tie between the next generation and worship, as well as greatly enhance the flow of our campus. As work on this feature begins you will soon see a new construction fence being erected on the east side of our campus. The connector is scheduled for completion in mid-August of 2019 and the fence will come down at that time. 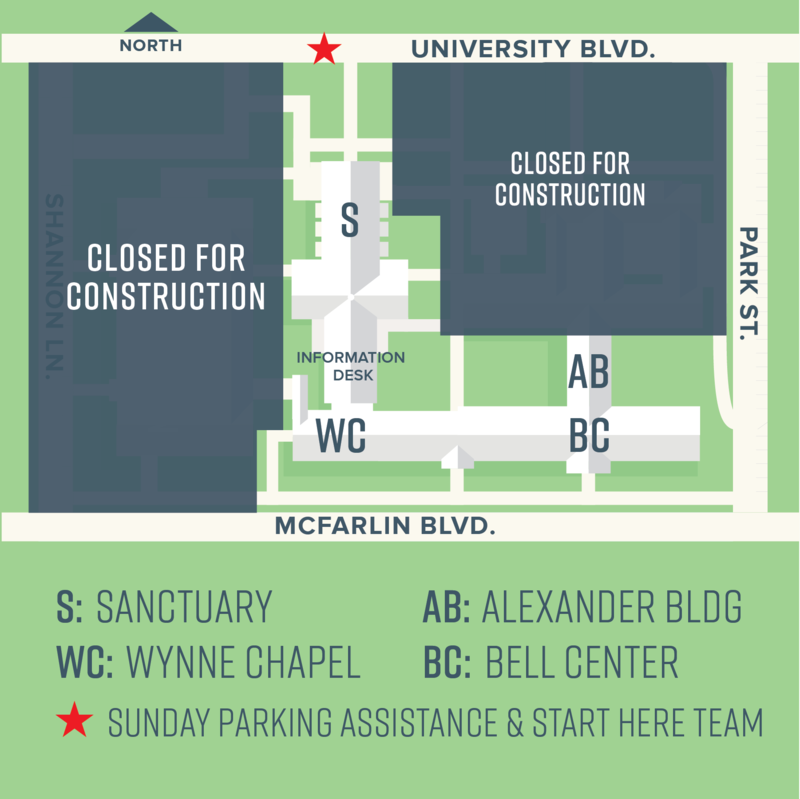 Please read the below map to learn how to get around our campus during construction, and stay up-to-date by reading the latest news at transform.hppres.org. As part of the Transform process, our main information and welcome desk will be moving to a new location on Wednesday, Feb. 13. Look for it in the office located behind the Sanctuary. 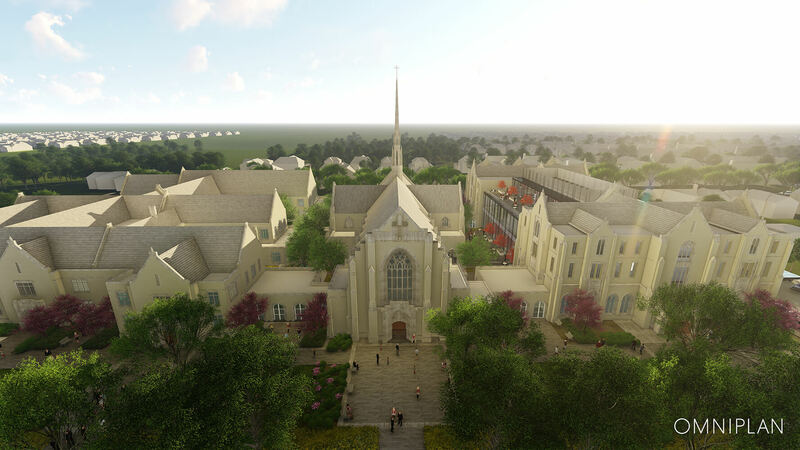 Thank you for your generous support of Transform, our initiative to make sure that the Highland Park Presbyterian Church campus is prepared for our next 100 years of ministry. The project’s physical construction work started in September with utility (water, sewer, electrical, communications) infrastructure relocation and installation to prepare for the Hunt Building demolition as well as support for the new building and renovation work to occur over the next 3 years. There were considerable rain delays during this period, but the demolition of the Hunt Building was completed on December 31, 2018. Debris and excavation work in the area will continue for the next 60-90 days. Watch the time-lapse camera that is capturing all of these changes online at transform.hppres.org/live-camera. The construction site has been fully secured with fencing and we ask all persons to avoid entering the secured area for your own safety. The Front Desk’s location, currently in the Bell Center, will change in the future as construction progresses across our campus. See where everything is located at hppres.org/map. 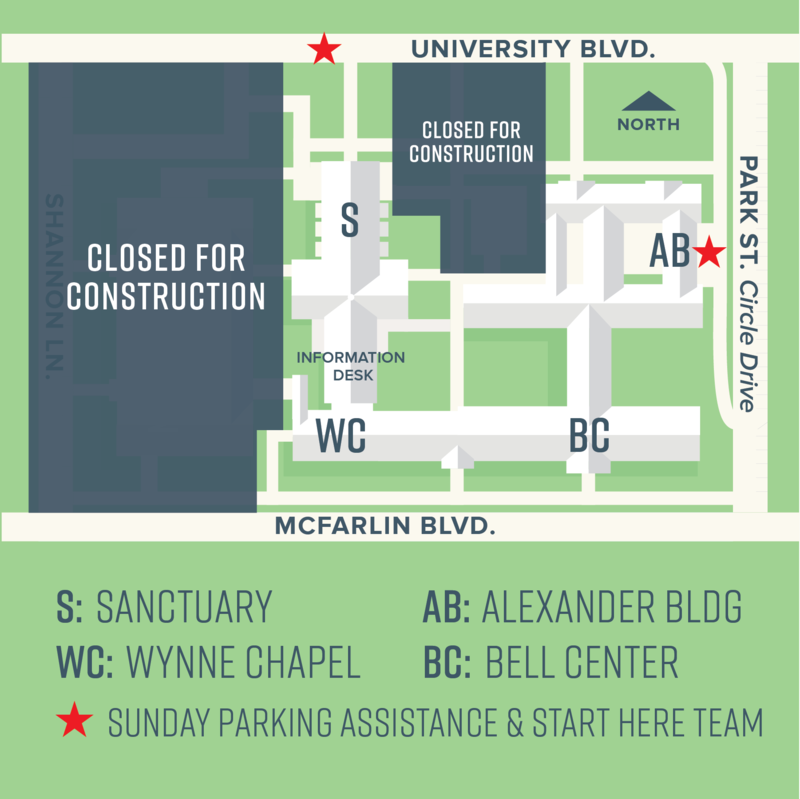 We ask that all visitors check in at the Front Desk first so that we may direct you around construction and to your destination on campus. Many of our staff members have relocated to new locations, both on and off campus. We appreciate all of their help during these transitions. Artwork and furnishings were inventoried in detail and items that were not retained for ongoing use or stored were donated to local ministries. Our financial budgets and actual spending to date continues to hold to plan. We will be committing a considerable portion of our budget on the new Hunt Building in Q1 as we obtain firm bids from our general contractor Rogers-O’Brien, and their suppliers. The Hunt Building project will be our primary work area over the next six months. 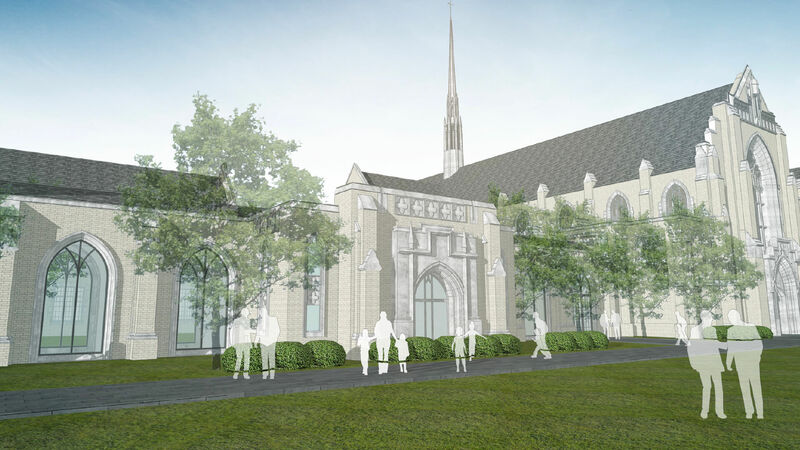 The Children’s Addition will start closer to Summer 2019 with the major renovations of the Alexander Building occurring during the summer months when Highland Park Presbyterian Day School and Hillier School are on summer break. 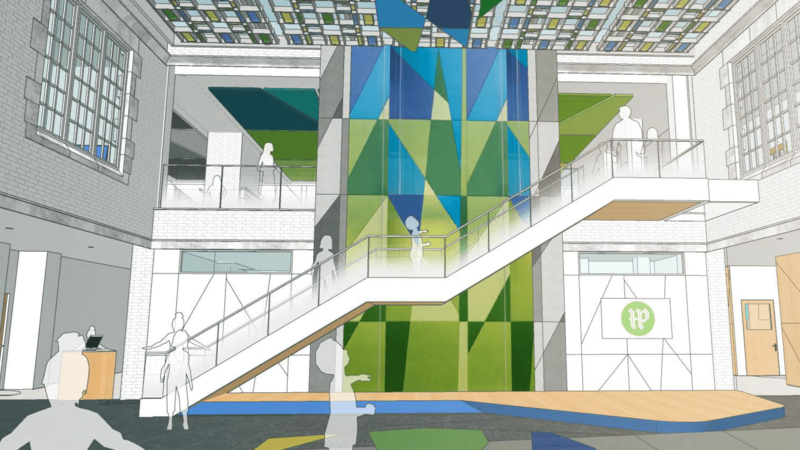 One very exciting change to the overall Transform project is the addition of a new gymnasium to be located in the interior playground in the Children's wing. This will eliminate the sport court 1/2 gym initially planned for part of the 3rd floor of the Hunt Building. The Session approved this project in the fall and while it adds new costs to our total project, we have secured funding for most all estimated costs. Along with Rogers-O’Brien, mentioned above, we acknowledge the outstanding work and professionalism of our key team including Echelon Leadership, as owner's representatives, and Omniplan Architects, our architects and engineers, for their commitment to this project. We thank all of you for your support and encouragement. We are also grateful for the support from our neighborhood families who have and will continue to be impacted by the Transform project.